Along with the 6,200 employees that Apple already has in the city, its new 133-acre development is expected to make it the largest private employer in Austin. Apple expects the new campus to accommodate 5,000 employees at first, though it will ultimately have a total capacity of 15,000. The new Austin campus will handle tasks ranging from engineering to customer support for the company. Like all Apple’s other facilities worldwide, the facility will run on 100 percent renewable energy. Along with its new Austin campus, Apple has also announced expansions across a number of other US cities. 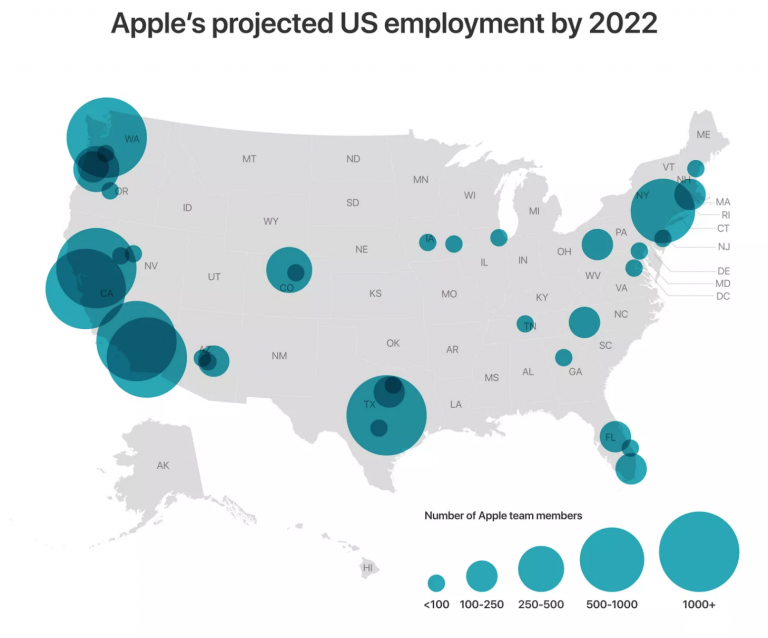 Seattle, San Diego, and Culver City will each grow to have over 1,000 employees apiece, and Apple also plans to expand its operations in Pittsburgh, New York, and Boulder, Colorado, over the next three years. In total, Apple employs 90,000 people across the US, and has over 1,000 employees per state across 16 states. Once again we see a major tech company going with the “usual suspects.” Austin is not a superstar city, but is a booming Sunbelt city with a longstanding tech cluster. Apple picking Austin may help explain how Amazon ended up in Nashville over Austin. Click through to read the full piece over at the Verge. With news that GM is closing its Lordstown assembly plant near Youngstown, I thought back to a short film I saw in grade school that made such an impression on me at the time that I never forgot it. In the wake of a strike at the plant in 1972, film makers interviewed workers at the plant and created a short documentary from it. Note at the scenes inside the plant are not from Lordstown. In fact, I think they are from a Ford plant. GM refused to cooperate with the film crew in any way, so they used other footage to give a look at life inside the plant in that era. If the video player doesn’t display for you, click over to watch on YouTube. Another GM plant that’s closing is the one in Detroit’s former Poletown neighborhood. Steve Malanga at City Journal takes a look back at the senseless destruction of a city neighborhood carried out to build this plant that will now just become another hulking ruin in Detroit. After years of substantially increasing numbers, working at home has now exceeded transit as an employment access mode. In 2017, 8 million people worked at home, compared to 7.6 million riding transit in the U.S. Since 2010, the share of workers at home has risen 21 percent, compared to transit’s 1 percent rise. More details will follow on newgeography.com shortly. The line had fallen 97 percent short of its projected ridership, according to The Korea Times, which reported that daily ridership was to have reached 490,000 by 2010, yet was only 16,000 last year. This may have been the highest projection error in the history of an industry plagued by such inaccuracies (see: High-Speed Rail: Toward Least-Worst Projections). Coincidentally, The Sunday Times indicates that many members of Parliament would favor improvements to the conventional rail service in the corridor, which would obviously cost much less. The Economist provides a useful perspective on the continuing decline of mass transit ridership in its current number. It starts with relating how Juana, a Guatemalan immigrant to Los Angeles, no longer takes the bus and now drives everywhere. She told The Economist that she had "two aspirations, to learn English and get a car," which she did. I heard a similar story a decade ago from a Gabonese student in Paris, who said that he needed a car "so that he could have feet." 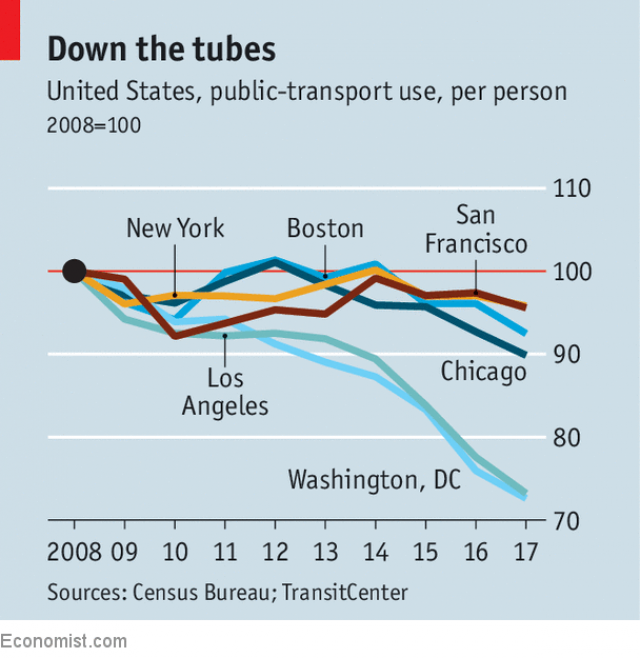 The Economist shows that the broad ridership decline occurring in US metropolitan areas (see graph) is also occurring in some of international cities, like London and Madrid. The Economist cites more liberal car loans, working at home and ride hailing services, like Uber and Lyft. Juana's story is typical. For the most part mass transit is not competitive with cars. The average employee in the New York metropolitan area (with the most extensive mass transit system in the United States) can reach 13 times as many jobs in 30 minutes by car as by mass transit. In some US cities, the car reaches at least 100 times as many jobs. There is no conceivable level of public spending that can materially change that. The car enriches lives in ways that mass transit cannot, by making millions of additional jobs accessible, by increasing shopping opportunities and by vastly expanding the potential for leisure and recreational travel. The reality is that when people can afford cars, they buy them.